Next up from our series of successful integrations of Nicereply is Best Practical, a very popular support tool with over 10 years of history. We’re going to try and take a different, shorter approach with this tutorial, so here is how you get Nicereply working with Best Practical in three simple steps. usernames, full names, and email addresses. The screenshot shows the screen after clicking on one of the users. Next, we have to activate the Ticket Link feature (Settings -> Ticket link) to link every rating to a ticket at RT. We put the ticket URL into “Ticket system URL” field, in this case it’s http://rt.example.com/Ticket/Display.html?id=>. Make sure to change “rt.example.com” to the location of your RT installation. Navigate to Configuration -> Global -> Templates. Some of you may have customised your correspondence template for each queue, in which case you’d have to make the change to each queue-level template as well. Insert the following to the correspondence template just above your signature. Important! 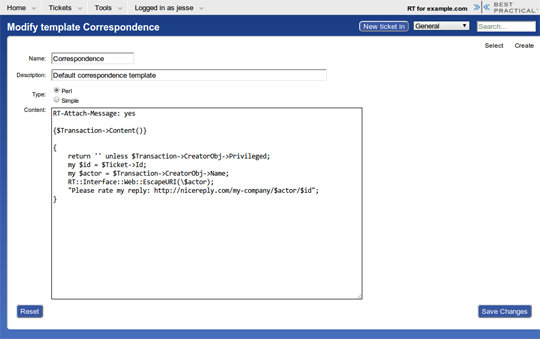 – make sure to replace the “my-company” in the url to your company name in Nicereply. We have now successfully connected Nicereply with Best Practical. 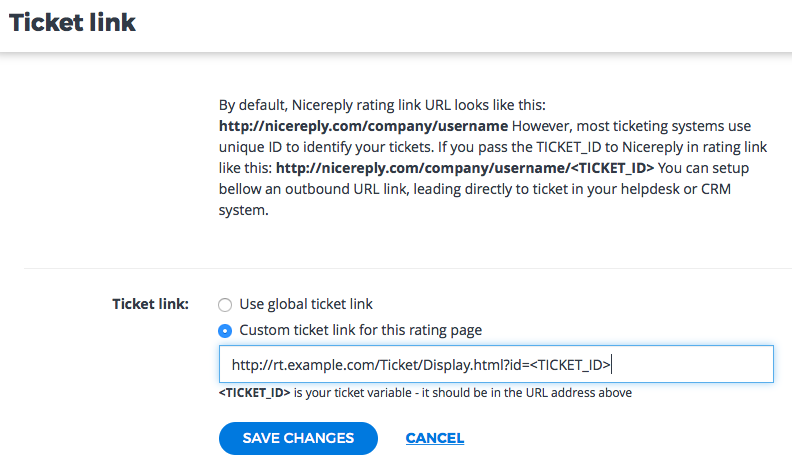 Your customers will now be able to rate your help desk emails and you’ll have the ability to easily evaluate performance of your help desk team AND see what ticket every rating relates to.